Virtual Ability: Books that are virtually free? Not only virtually free, but virtually books! The collection, put together with creativity and energy by Cape Serenity’s manager, avatar Ladyslipper Constantine, celebrates the diversity and capabilities of persons with disabilities from all over the world. Local authors from the Virtual Ability community share works such as “Headless Horseman” (Ronin1 Shippe), or “Poems” (Huber Grantly). As one of the properties of Virtual Ability, Inc. in Second Life®, Cape Serenity is a beautiful, quiet residential island featuring ponds, wildlife, gardens, and plenty of shoreline. 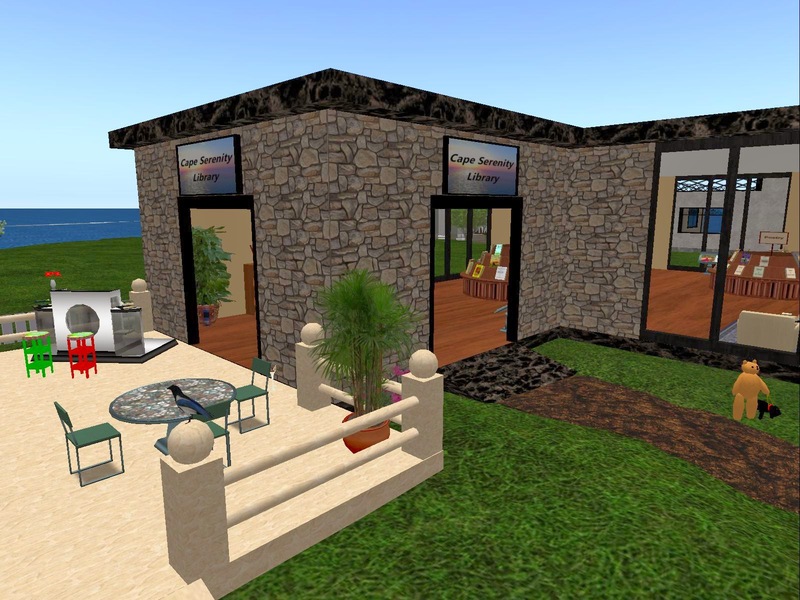 On the patio of the Library, friends and members of Virtual Ability community in Second Life® can gather for poetry readings, book discussions, and other special events. As a key part of Virtual Ability, Inc.'s mission to help make virtual worlds like Second Life® accessible to, and supportive of, individuals with disabilities, it has developed into a diverse community that includes people with disabilities, professionals, service providers, and others who care about issues of disability. Since entering Second Life® in 2007, the Virtual Ability community has grown to include over 850 people. While Cape Serenity features an amazing specialty library, avatars can also visit an art museum over at Cape Able, a tavern and swimming pool at our apartments, or training areas, a playground, and an award winning Orientation Path designed for newcomers to virtual worlds, at Virtual Ability Island. Virtually free virtual books are exciting. And, they’re just a small part of the excitement of Virtual Ability.